Doris may not have a classroom, but she is a teacher nonetheless. As seen on, Red said what? I think the kid might be right. A sentinel for youngsters and teenagers, siblings in strollers, parents and pets as they travel to and from parked cars, school, practice, religion, and home; pedestrians welcome her presence. Many drivers do not. They are forced to sit, wait and wait some more until Doris releases them with a flick of the neon flag. Held up for work or a midday appointment; some grumble, honk, and huff. Others rant on social media; the rest stress in silence. I got over it. 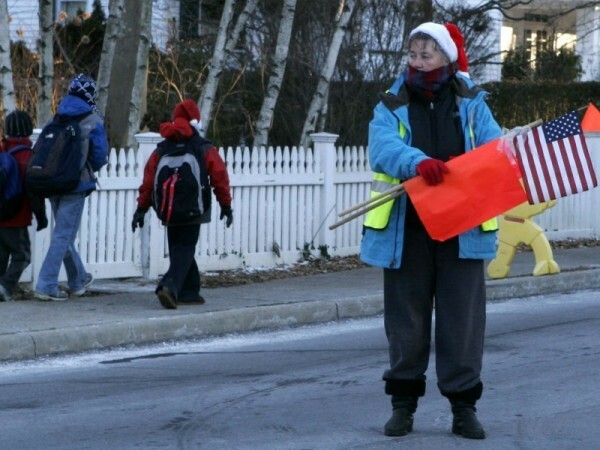 We regular walkers know something about the way our crossing guard approaches her job that drivers may not notice from behind the windshield. Doris teaches children the value of a greeting. As they developed a rapport, she added compliments about Skootch’s smile, noticed haircuts, and congratulated him when he was able to walk the distance sans carriage. Doris showed Skootch respect. He reciprocated the sentiment. Now, not a morning goes by on my little guy’s way to Kindergarten that he doesn’t wish Doris a good day. The same holds true for many middle and high schoolers who take time to look away from friends and up from phones to say Hello, leading me to believe her lesson has been repeated before. She models generosity of spirit. New to the district, I was shocked to see Doris sitting in the audience of Bubbe’s first grade play. The parents who had older children were not. As it turns out, she does her best to attend each of the roughly 24 class plays held annually at the elementary school. And during the holiday season, those who walk her way will find Doris’s open car trunk spilling with free cookies for the kids. Such gestures are not taken for granted. When a few families found out she was having a “big” birthday, moms spread the news on Facebook. The next day, her “office” was decorated with signs, balloons, flowers and handmade cards. She gives parents peace of mind. Bubbe often walks with our young neighbor long before Skootch and I head out for the morning. Even though she and I have only exchanged pleasantries, Doris knew which child belonged to me and took the time to report he was making good choices. And reminds us to take it easy. I continued onward, slowing my gait for the last block and a half to my destination feeling pretty confident that, after spending my few moments with this special lady, the world was safe from annihilation for one more day. It takes a village to shape a community.